I was nominated by Latched On Mom for the One Lovely Blog Award and I am pretty blown away by it actually, thank you so much for your recognition Lucy! It means so much to me! 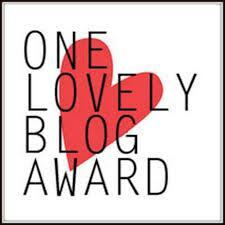 What is the One Lovely Blog Award? The One Lovely Blog Award is an award that is passed from one blogger to another and is a way of discovering new bloggers as well as getting to know them a bit better. What are the One Lovely Blog Award rules? • Thank the person who has nominated you and provide a link to his/her blog. • Include 7 facts about yourself. • Nominate 15 other bloggers and let them know that they have been nominated. • Display the award logo and follow the blogger who nominated you. Here are seven random facts about me and my family! I am a type 2 diabetic and have been since I was pregnant with my now 25 year old, but have never taken medicine for it. Growing up I was terrified of dogs, now I have to have at least one. I did not know I was going to be a grandmother until after the baby was born. I was a foster parent and adopted my 21 year old daughter out of foster care when she was 12/lived with us since 9 and we were her 11th placement. My husband was born in Scotland and raised there for part of his childhood. Blogs I love and nominate for this award!